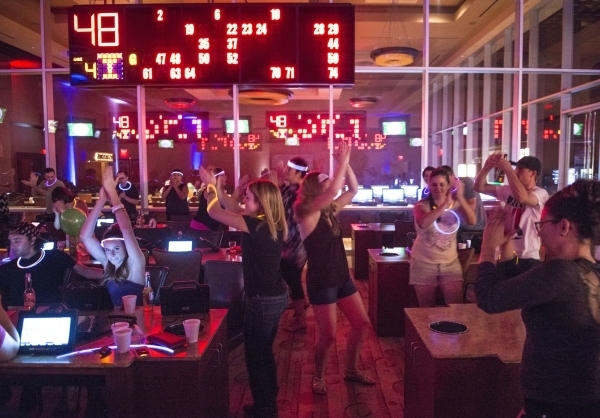 This isn’t your grandmother’s bingo: Red Rock Resort has upped the ante on the normally low-key game by infusing it with rock music, shots of liquor and a dance club atmosphere. Called Rock Shot Bingo, Station Casinos first tried it out at Green Valley Ranch Resort, 2300 Paseo Verde Parkway. Now, it’s come to Red Rock Resort, 11011 W. Charleston Blvd. Monica Lewis of Summerlin said she comes to Red Rock Resort weekly and tried Rock Shot Bingo. 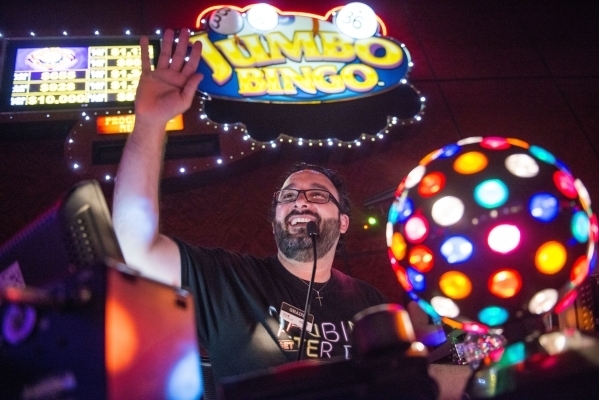 Bingo room manager Jimmy Pedulla estimated that Rock Shot Bingo sees 100 to 250 attendees per session. People poured in, about 125 total. They got their glow sticks and portable bingo players and moved to the beat as they found a seat. One girl whipped multiple glow sticks in the air as she danced. His instructions were met with whoops and cheers. How it is different than Chippendales for him? “Well, here, we keep our clothes on,” he quipped. 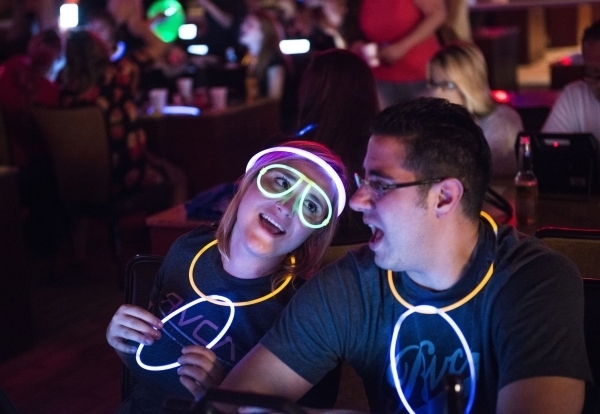 Some people weaved the glow sticks into headbands, while others made eyeglasses out of them. Still others had multiple ones in Olympic-style rings hanging off them. One table of women never sat in their seats but remained dancing the entire time, glow sticks bobbing to the beat. 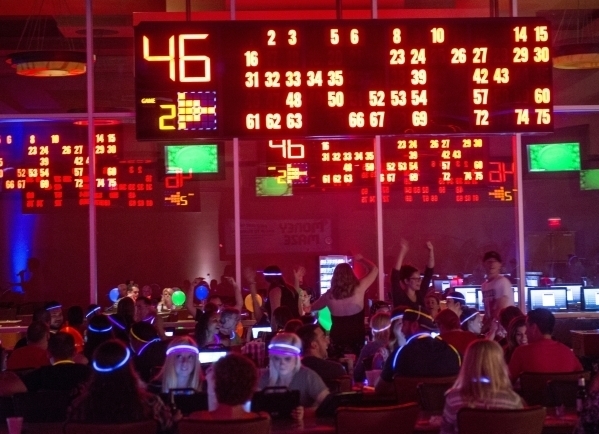 When bingo numbers were called, they could barely be heard above the music. It didn’t really matter, as the machines auto-populated with whatever square was called. 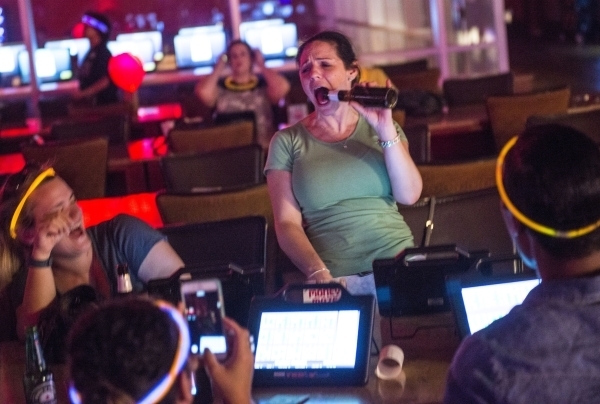 When someone got a bingo, the cocktail waitress appeared like magic with a round of shots for that table. Prizes were given away. 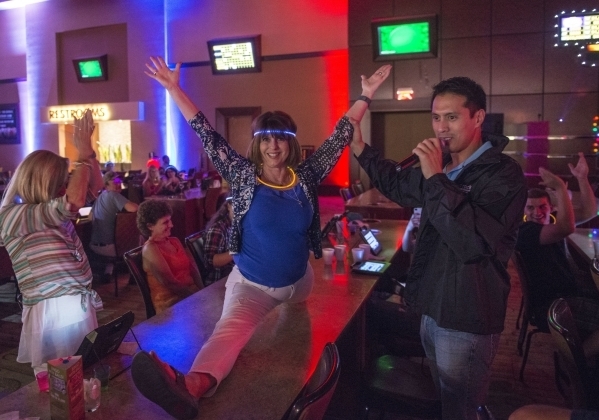 One woman won pool passes after she executed a perfect split on the table. Brianna Middlefield of Southern Highlands was there with her husband, JP. She said Rock Shot Bingo spoiled her for regular bingo. “This is more exciting, more fun,” she said before lifting her hands up as she chair danced. 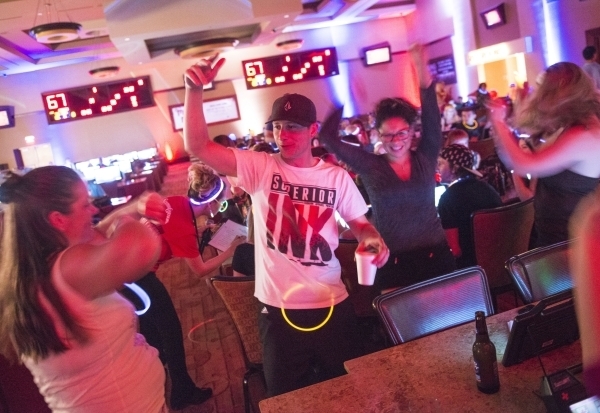 Rock Shot Bingo is scheduled for 9 p.m. Nov. 12 and Dec. 10 at Green Valley Ranch Resort in Henderson. Registration beings at 8 p.m. It’s scheduled for Oct. 22, Nov. 19 and Dec. 17 at Red Rock Resort. Each session costs $25 and includes two free drinks and 10 electronic games with a total of 30 cards per guest. Another version of Rock Shot Bingo called Daubing After Dark offers the same prizes and has party music but no shots and no disc jockey. Daubing After Dark is slated for 11 p.m. Fridays and Saturdays. Visit greenvalleyranch.sclv.com or redrock.sclv.com, or either casino’s bingo room.